The "One Man Show" of Egyptians politics is coming to an end soon! The regime is insisting on a dramatic end. On the surface oppressed Egypt appears to be calm, the sails of this regime is thought to be well tuned to intercept the winds of change that are blowing from every direction, the Tsunami wave is approaching but with a closer look underneath the surface the hurricane is imminent. After 24 years of anti-biotic and aspirin, the body (or the corps) is not responding to the same medications and the Doctors of the regime are gambling that it will works and the rationale behind their strategy that it always worked in the past and it will work in the future. They do not want to get a right diagnosis, they cannot believe that the body is viably sick. In his last speech Mubarak said:" Because of this victory (October's victory) we (as in the Egyptian people) have moved from getting back our occupied land to the independence of our political life and to our national economy.. We have put in place the necessary institutional and legal framework for a democratic base.. and we built an advanced legal and information infrastructure that is required to any advanced economy..."!! Last February when Mubarak stated that he is going to change article 76, Egyptians thought that the new imported drug will be effective and can relief a bit the symptoms of the sickness to soon find out that this is the same homegrown reform (New vision) that has no effectiveness. When Mubarak stated in his election campaign that the "newer vision" will be implemented if Egyptians voted for him, some thought that the newer drug is the real deal but soon Egyptians figured out that it is again the same old tranquilizers! The "newer vision" calls for nominating Youssef Wally, Kamal El Shazly, Ibrahim Soleiman, Fathy Sorour to the Parliament or in other words saying "TOZ Feekom" to Egyptians, adopting Gamal's new vision of extreme fanatic capitalism, implementing the same strategy of status quo and the deadly medicine of stabilizing the corps. This is a recipe for a chaotic revolution and not a medicine to get Egyptians out the intensive care unit. 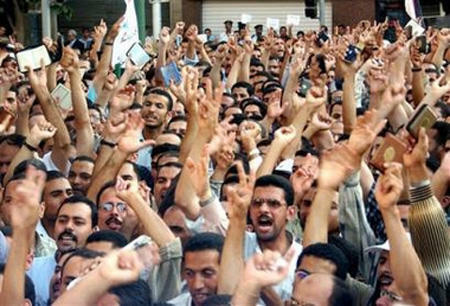 Egyptians are warming up for a revolution and the Regime is putting the final touches of their plan to start this revolution. 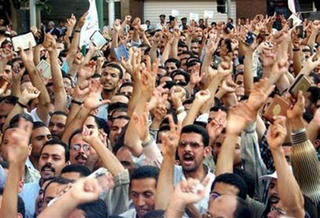 I agree with you that the foolish acts of Mubarak and the Gang will will lead to a complete Chaos!!! Do u really believe that the sick body will be able to rise up and stand for itself ...?!!!! Beside the current regime managed to transform a big percentage of people to sense-less ethic-less beneficiaries of the current mess. I really hope that this happens , nevertheless, I doubt it. Yes I really believe so...specially after the regime raises the prices of necessary goods again (new vision)! Gamal mubarak is a gay" sure thing,no doubt",will the Egyptians accept a gay president!